National Persian Gulf Day is an annual observance in Iran that was first suggested in January 2004 and approved by the government in July 2005. It is celebrated on April 30 throughout the county, especially in the coastal cities of the gulf. 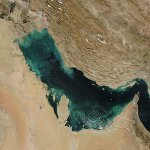 The Persian Gulf is a mediterranean sea that lies between Iran and the Arabian Peninsula. Its name has been disputed for decades. Historically and internationally it is known as the Persian Gulf, but some Arab countries insist on using the name Arab Gulf. Iran only uses the historical name because it refers to the Persian Empire, the predecessor of present-day Iran. The name Persian Gulf is actively promoted by the Persian Gulf Online Organization (PGO). In 2004, it offered the Ministry of Culture and Islamic Guidance to establish a new observance dedicated to the Persian Gulf. A year and a half later, National Persian Gulf Day was officially created. The date April 30 was chosen to commemorate the anniversary of the successful military campaign carried out by Abbas I of Persia. In April 1622, he took over the Portuguese garrison at Hormuz Island in the Persian Gulf and expelled Portuguese military from the gulf. Persian Gulf Day is marked with ceremonies held primarily in the coastal cities.